Don Mock: The II-V-I Progression, every musician who studies jazz finds themselves in the land of II-V-I's at some point in their learning. This short chord progression offers an immense amount of possible harmonic and melodic substitutions. Don Mock: Most players, including myself, would have to admit that nearly everything we know how to play from licks, substitution concepts, chord voicings etc., can be applied to a II-V-I progression. It's the ultimate study of the workings of music; all packed into three little chords. Don Mock: II-V-I progressions are the mainstay of traditional jazz standards. Many tunes owe their entire structure to linked II-V-I's in various keys. A trip through any "fake" book reveals hundreds of tunes crammed with II-V-I progressions. Don Mock: The II-V-I is a perfect teacher of "tension/resolution" regardless of which style/era you want to play. I would bet that most modern jazz players, who are known for employing techniques such as "superimposition" or "playing outside," probably paid their dues learning II-V-I phrases and substitutes. Don Mock: Let's start with a few chord voicings. Here is a classic position for a II-V-I in C. Dm7-G7-Cmaj7. 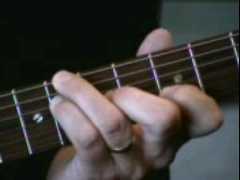 Rick: when would you play the 1st set of chords vs. the 2nd set? kito: i m hearing chords/how to i get your solo? Don Mock: one thing to remember is that most of the best guitar voicings have only 3 or 4 notes. Your goal over the next week or so is to learn some II-V-I chords in another position. In this same key (C), another good location is around the 8th fret. Here's the basic ones to get you started. Bill: what is chord voicing ? Chris: can these chords be used in blues progressions also? LarryWjazz: These are especially useful in blues progressions. Very cool Don. Mark: Don - For chord group 3, on the cm9, how do you do a stretch from 4th to 8th? Don Mock: Now it's blues time guys. 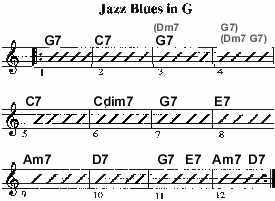 Let's take a look at a jazz style blues progression. This one is in the key of G and has several II-V-I's within the 12 bars. Don Mock: With the jazz blues Jam Track, practice the chords. When you get to bars 4 and 5, play our new chords. Don't forget to play C7 instead of Cmaj7. A variation you can play is to start the Dm7 earlier. Play Dm7 for bar 3, G7 for bar 4, and C7 for bar 5. Now add another II-V-I in bars 9, 10 and 11 (Am7-D7- G7 etc.) Just slide our voicing up to the key of G. Let's change gears and look at some scales to use over a II-V-I. 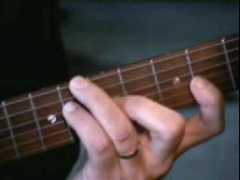 When in doubt, you can always play the key center major scale over all three chords. Play a C major scale over a II-V-I in C. That's it. Here's the pattern I'd use for C major around the third fret. Don Mock: If you would like to create additional tension over the V chord, The melodic minor scale is the top choice. There are actually four different melodic minors that can be played over a V chord. But the the most popular is the melodic minor that lives 1/2 step above the root of the V chord. Play Ab melodic minor over the G7 in a II-V-I in C. But remember, only over the G7. You must resolve back to the C major scale when you arrive at the Cmaj7 chord. In our blues, resolve to the F major scale for the C7 version of the I chord. Here is a good pattern for Ab melodic minor in the 3-4th fret area. Don Mock: Larry: yes, Howard was a great friend since '73. Now's a good time for me to plug my new book on the melodic minor scale. It's called "Guitar Scale Secrets; Exploring Melodic Minor" from Warner Bros. It's got just about everything I know about the melodic minor scale. If you can't find it in a nearby store, you can order it from Guitar Axis com. Don Mock: Bill your close, but arpeggios are every other note in a scale, lick 1, 3, 5, 7, etc. 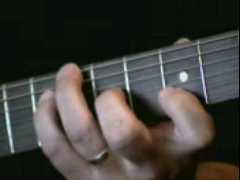 I hope to see you next week and check out the chord phrases in the this week's EMP "lick of the day"